The first step is deciding the scope of your project. If you need just a few stones, skip to Step 2 where you choose your brick or stone. If you are planning a fundraiser, check out our Gallery to see some ideas in action. 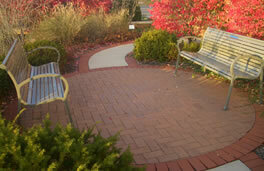 We offer Laser Engraved or Sand-Blasted Bricks, Stones, and Pavers. You can add symbols and/or pictures as well as text to your engraved products. Find out more about the various products available. Now you’re ready to get your fundraising project going! Our Forms Page has all the various forms you will need to carry out your fundraiser. Have questions? Check out our FAQ or call us at 419-408-4129. Engraved Brick Pavers offers a full line of pavers and bricks. We use a computer generated process to personalize each brick or paver. We offer three types of engraved bricks: Laser Engraved, Epoxy Filled, and Stained. Our state of the art Laser Engraved bricks are the most popular among our clients because they are highly durable and environmentally friendly. They are produced using a high powered laser that actually melts the surface and turns it to glass. The result is a very detailed image that will last forever. We would love to speak with you about your engraved brick needs. Whether you are planning a fundraiser that will involve thousands of pavers or you simply want an engraved stone for your garden, we can help. Call 419 408 4129 today to get started.